Description of the words. 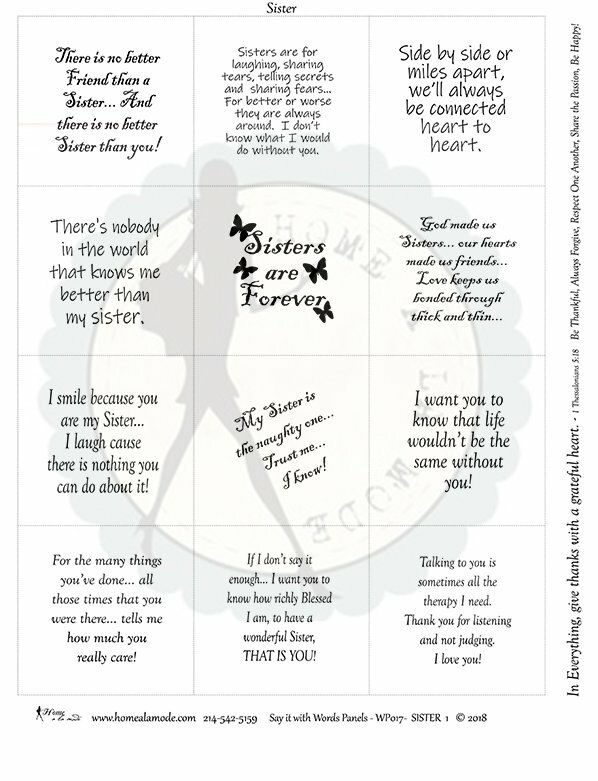 Sharing with your sister words and phrases like… There is no better Friend than a Sister... And there is no better Sister than you! Sisters are for laughing, sharing tears, telling secrets and sharing fears... For better or worse they are always around. I don’t know what I would do without you. Side by side or miles apart, we’ll always be connected heart to heart. There's nobody in the world that knows me better than my sister.. Sisters are Forever. God made us Sisters... our hearts made us friends... Love keeps us bonded through thick and thin... I smile because you are my Sister... I laugh cause there is nothing you can do about it! My Sister is the naughty one... Trust me... I know! I want you to know that life wouldn’t be the same without you! For the many things you’ve done... all those times that you were there... tells me how much you really care! If I don’t say it enough... I want you to know how richly Blessed I am, to have a wonderful Sister, THAT IS YOU! Talking to you is sometimes all the therapy I need. Thank you for listening and not judging. I love you! In Everything, give thanks with a grateful heart. - 1 Thessalonians 5:18 Be Thankful, Always Forgive, Respect One Another, Share the Passion, Be Happy!